A hardly essential visual prop, or a viable electric-meets-acoustic hybrid? We'll go for the latter. There's a sense of 'style over substance' here. Undoubtedly one of the 'hits' of this year's NAMM gear-fest, judging by the amount of social media interest it generated, this Bigsby-equipped Gretsch Rancher is clearly designed to get you noticed. "It really did start with, 'Hey, let's put a Bigsby on an acoustic!'" says Gretsch's Adam Bowden-Smith. "But what followed was about a year and a half of extensive R&D to get the guitar top correctly braced so it was strong enough to make the Bigsby usable without the whole thing collapsing!" "The instrument is a pretty weighty, overbuilt proposition for an acoustic, even with the extra hardware"
And that's a good place to start, as the instrument is a pretty weighty, overbuilt proposition for an acoustic, even with the extra hardware. It's all-laminate - unusual for a modern acoustic guitar at this price point - and the top has two chunky longitudinal braces, as well as some reinforcement plates under the bridge and the Bigsby. The back and top are also noticeably arched, again to add strength to the structure. But it still looks cool. The striking triangular soundhole recalls the Rancher acoustics of the 1950s, designed to appeal to the country and western market. The shape of the guitar, with its steeply tapering sides, creates a shallow, but not thinline, depth and makes it a lot more endearing and comfortable than the concept suggests. It's also cleanly built. The red finish coats only the top; the finish to the back, sides and neck - which has quite an attractive figure on our sample - is a rich 'natural' mahogany colour. The polyester finish is quite thick, but that may help its plugged-in performance, if not its acoustic projection. There's not a shortage of pickups for acoustic guitars, but Gretsch was having none of them. Instead, the firm developed the Fideli'Tron humbucker specifically for this guitar (although due to the prolonged R&D time, Fender got to use it first on several more conventional guitars, including the Cabronita). "The 'Fideli' in the name gives the clue," adds Adam. "We wanted the pickups to have clarity and a clear response, with minimal distortion (ie, low output), suited to acoustic guitars. They do necessitate using nickel or steel strings, of course." The placement of the pickup seems unusual, in that above the soundhole is, usually, the fingerboard. Not here. Gretsch curtailed the 'board at the 16th fret so there was room for the pickup. But there is method in the madness. As part of the R&D, Gretsch developed an "isolation chamber in which the Fideli'Tron is encased. This separates the pickup from the rest of the guitar to minimise potential feedback issues." This iso chamber seems to be a wooden box under the top, that encases the pickup. Are we alone in thinking this is one of the most unusual 'acoustic' guitars we've encountered? "We can't fault the mainstream neck shape, tidy vintage-style frets and very electric Gretsch-like playability"
Hold on to your hats, it's going to get weirder. 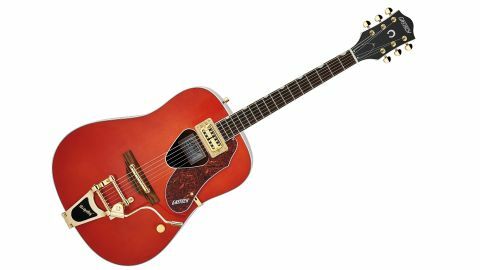 The combination of the admittedly rather creaky Bigsby and the sizeable metal bar bridge certainly offends our acoustic purist sensibilities, but we can't fault the mainstream neck shape, tidy vintage-style frets and very electric Gretsch-like playability. After string stretching, the Bigsby, for light shimmers at least, stayed in tune; and while the acoustic projection isn't voluminous, there's an old-school archtop or semi-like resonance that hints at its plugged-in performance. Played seated, it's a little body-heavy, but when strapped on via the two strap buttons it feels more comfortable. Plugged straight into various amps and our Line 6 Stage Source mini-PA, this is no pristine modern electro-acoustic sound. It has more low-end than our jazz reference Epiphone archtop, not least due to the position of the humbucker, which is further away from the bridge than pretty much any archtop; but adding an LR Baggs Venue DI to our signal chain, and removing some lows and lower mids, and brightening up the high-end, we're into more usable territory. Switching to a Peavey Delta Blues, with its onboard tremolo and spacious reverb, we begin to get it. A big, dark single coil-y voice that is both atmospheric and textural - a great overdub guitar or a pretty electric-sounding 'acoustic' that'll get you noticed in a good way. Many will see this as a publicity stunt by Gretsch, as opposed to a real musical innovation. And if we're honest, although it initially brought a smile, we'd probably say there's some truth in that. Is it really much different - appearance aside - from any other Bigsby-equipped hollowbody electric? It's certainly less versatile. But while our head says no, our heart is drawn to not only the unusual concept but also its usable sound: it's the sort of thing Daniel Lanois would use to create a soundscape. It blurs the line between electric and electro-acoustic; and for the creative musician, that's no bad thing: it's a guitar that takes us somewhere we weren't expecting. Whether you think it's worth the asking price will depend on your musical and stylistic taste. But in the me-too modern guitar market, anything that dares to be different is welcome.